Yesterday when I was at the farmer's market, I wasn't able to find such a large selection of cheap, reduced rack produce. The one thing I did manage to find a lot of was fennel bulbs- I came home with a huge shopping bag full, at only 25 cents a pound. Fennel, also called anise, has one of those flavors that you either love or you hate. I am in the love-it category. I generally eat fennel raw in salads, but it tastes phenomenal cooked- its licorice type flavor is a bit more mild when it is cooked, and its texture is almost creamy. Honey and mustard are the perfect flavor accompaniment for fennel's licorice like taste. This is my go-to cooked fennel recipe, and it is what I'm serving for supper. Absolutely delicious. P.S. The fennel bulbs bought in the store are similar but different from wild fennels, which are all fronds, no bulbs. 1. Cut the fronds off the fennel if there are any there. Save for another use. Wash the fennel well. 2. Slice the fennel bulb into quarters or halves, depending on their size. 3. Lay the fennel halves or quarters down on a lined baking tray or pan. 4. Mix all the rest of the ingredients together, and drizzle them all over the fennel. 5. Bake at 350 for 30-45 minutes, depending on how soft you want them to get. 6. Eat hot or cold. 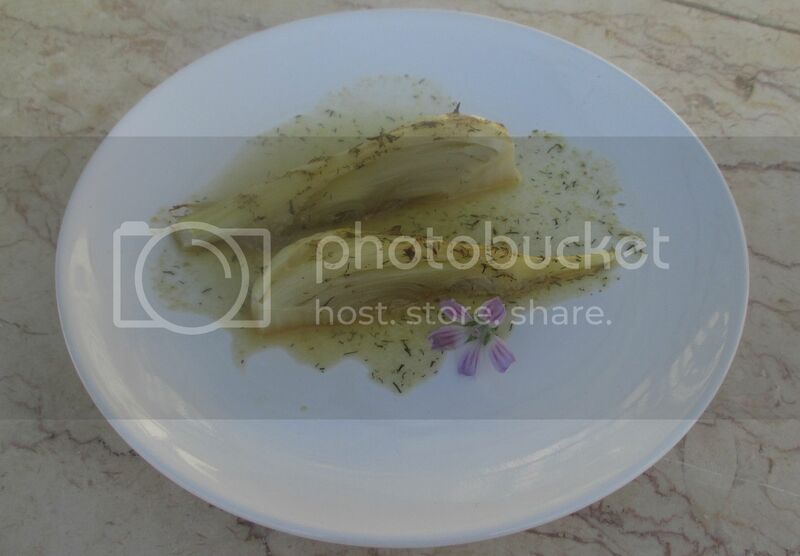 Variations: If you can't get your hands in fennel, you can prepare cabbage wedges this way as well. Just cut your cabbage into eighths or so, drizzle with this sauce, and bake. Ever prepare fennel bulbs before? What is your favorite way to eat it? Have you ever cooked fennel? Does this look like a flavor combination and recipe you'd enjoy? > How many people is it supposed to feed ? 14 fennels looks super enormous to me, maybe my local fennels are much bigger than yours ? O_o I am cooking 2 fennels for 2 people tonight. > I used "non-grind" mustard (not sure if it has a name in english...) and brown sugar, so the seasoning came really thick (is the sauce supposed to be thick so it stays on top of the fennels ? or more watery as a marinade ?). Hum... the quantity of fennel worries me the most... to be able to adjust the cooking time & the quantity of sauce. Well... I baked it for 20 minutes, and it is already getting too dry at the surface (while still raw). I am confused. Didn't you add any water to the sauce ? Did you cover the baking pan ? My Latest Super Frugal Grocery Shopping Trip!